Today is kind of a weird day, and I’m about to make it a little weirder by skipping a recipe entirely. But it’s Life As A Strawberry’s third birthday (????) and I figured a blogaversary is the perfect time to be a little weird (“but Jessie, you’re a little weird every day…” <— SHHHH) and celebrate how much I and you and all of us love food in a way that isn’t just making myself a cake (although I will probably also make myself a cake, because cake). I figured maybe today, instead of throwing my new favorite dinner in your face, I’d tell you a story about me, Life As A Strawberry, and food. And also share a peek at the results of my Master’s research (which I have been promising to do for what seems like eternity but totally haven’t done until right now, and I would like to say it’s because I had a master plan to wait until the blog’s birthday to share it but really I’m just lazy and it’s quite nerve-wracking to publish this post so, umm, please be kind if you leave a comment?). If you’ve known me for awhile or heard me speak at a conference, you know that my academic background is in food security. I grew up watching my Mom (Hiiiiiiiii, Mom!) in the kitchen (she’s a caterer) and learning to love not just food, but the community it created. When I was 15, Mom started a nonprofit called The Table that provided free meals and groceries to the working poor around Portland, Oregon (where I grew up). I spent most of high school and college breaks working at The Table – even running the kitchen a few times – learning a lot about food, cooking, and what it means to be hungry in America. More than anything else, I listened to people’s stories. In college, I double-majored in Environmental Studies and Sociology, working on a handful of research grants that looked at food security and poverty and ultimately winning a Ford Fellowship to study how childhood foodways (the ways kids eat, cook, talk, and think about food) impact adult cooking habits. (Results in a nutshell? Teach kids to cook. 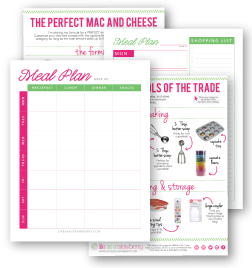 As adults, they’ll then eat better, cook at home more, and be more confident in the kitchen). After college, I was juggling two part-time jobs – one as an event planner for my alma mater and one as a business manager for a small arts nonprofit – and feeling a big food-shaped void in my life. 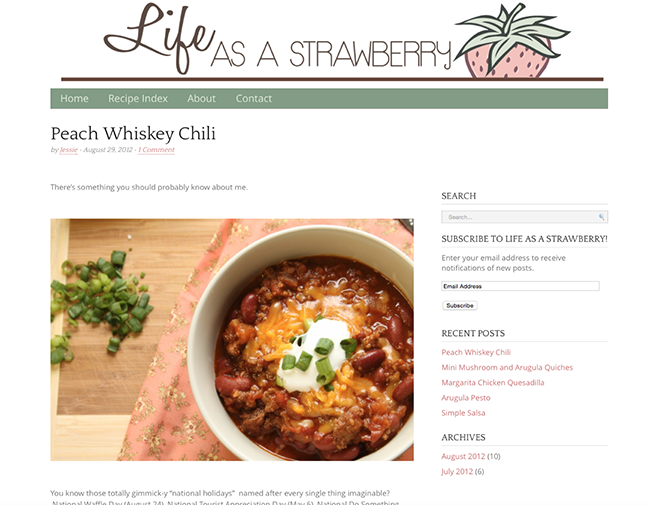 So I started Life As A Strawberry – in part to force myself to use the camera I’d spent a whoooooole lot of my dollars on, and in part to reconnect with the food world that I’d come to feel was such a big part of me. The intention was always to use this blog not just for recipes and photographs, but as a platform to talk about real issues in the food system. (Ultimately, as you probably guessed, that idea led me to The Sustainable Seafood Blog Project). Between the blog and the SSBP, I felt like I was doing real, important work with food again. And it felt good. My original blog design from 2012. Fast forward a year or so and I’d quit those part-time jobs, done some major design work on le blog here, dragged my car and Kyle and my basil plant and everything else we owned to New York, and started my Master’s in Public Administration at Cornell. I came here to do food work – to expand my research on hunger and sustainable food systems and to work with some ridiculously smart people and to get better at, well, making the world a little bit better. To be honest, internet friends, I’m still not sure whether or not my MPA was the right or best thing to do (but that’s a story for another day over another cup of tea. Or maybe whiskey? Yes. Definitely whiskey). But it did give me the opportunity to find out who I really am as a researcher, and to learn whether I can hang with the Ivy League big kids when it comes to original academic work. (They approved my thesis, so I think that means I can? But they should really give you some kind of diploma addendum that’s like, “Graduated, but also officially not a dummy who just got lucky and passed all her classes”). So I went back to hunger. Specifically, I went back to The Supplemental Nutrition Assistance Program (SNAP, formerly known as food stamps) and the stigma associated with welfare receipt in America. If you’ve ever read an article about SNAP (or worse, the comments section of an article about SNAP) you know that people have some very, VERY strong opinions about who should and shouldn’t receive government assistance. The problem is that often, those opinions are only based on assumptions. So I wanted to know – how much does the general public really know about SNAP? And, if they have all the facts, are they more likely to support the program and its beneficiaries? The results? We found that people with accurate information about SNAP and SNAP recipients are more likely to support the program and be understanding towards its beneficiaries. 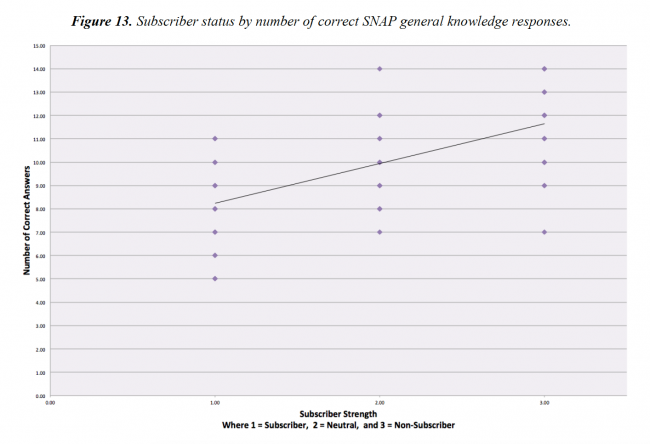 One of the many figures included in the final report, this graph shows that non-subscribers – people whose survey answers identified them as demonstrating little to no prejudice against SNAP recipients – answered general knowledge questions with a higher degree of accuracy than subscribers (those whose survey responses identified them as highly prejudiced towards welfare recipients). But here’s the thing: addressing the misinformation and stigma associated with SNAP is just a small piece of the work we need to do to fix our food system. Hunger and poverty aren’t stand-alone issues – they’re often just symptoms of much larger structural and social inequalities. We can’t talk about hunger without talking about things like food deserts, fair pay, and structural inequality. And we can’t talk about a sustainable food system without talking about hunger. Sustainability is more than just making sure there are enough fish left in the sea. It’s also about making sure everyone – regardless or who they are or where they live – has the ability to participate in a sustainable food system. It’s about making sure the farmers and the fishermen and -women who feed us are paid fairly and supported by enforceable regulations. It’s about looking critically at transportation and processing standards. It’s about prioritizing sustainable, healthy food in low-access communities. These are big issues, and there are big, scary questions attached to them. But I think this research – and a ton of amazing work being done all over the country at other universities and by other organizations – is a step in the right direction. There’s a long way to go, but we’ll get there. And someday, hopefully, we can all sit down together over a glass of wine and a delicious, sustainable feast and toast to a job well done. Caucasians receive more SNAP benefits than any other racial or ethnic group (USDA, 2014). Maximum SNAP benefits are set equal to the cost of the Thrifty Food Plan, a government-estimated cost of a nutritious diet (USDA, 2014). The average SNAP benefit per person per month in 2013 was $133.07 – less than $1.50 per person per meal (USDA, 2014). The majority of working-age, non-disabled SNAP participants have a job. More than 60% of SNAP recipients are unable to work because they are children, elderly, or disabled. Still, 43% of SNAP recipients lived in a household with earnings in 2013 (USDA, 2014). SNAP benefits can’t be used to purchase non-food items, including alcohol, tobacco, and prepared food like takeout or delivery pizza (USDA, 2015). SNAP funding is decided as part of the U.S. Farm Bill. (Congressional Budget Office, 2012; USDA, 2015). If you want to know more about these facts or the full final report in all its statistics-y glory, check out the linked resources above or feel free to email me! I found your blog through the excellent break baking method with the dutch oven, and pleasantly surprised to see the efforts you have taken to address a critical issue (I would say in America and world wide). Best of luck in your work! This is important work, Jessie, so thanks for doing it. I’ve even found that stigma can keep people who could really use the assistance from signing up. Thanks Shane!! Totally true (and terrible) that stigma can be a huge deterrent to participation for people who need help the most. Just plain flat out Congratulations. Jobs well done. Keep up the caring good work. Thank you. Hungry people need all the help they can get. The public hates everything, but mostly not informed. I fear a vast majority of haves want the rest to pull those bootstraps!so they do not need to be informed. Keep up the good work. Start with Congress?? First of all, Happy Blogiversary! Second of all, I think your thesis research is brilliant and it DOES matter. Just looking at the facts you posted at the end of the SNAP program that most people do not know, I bet a lot of people would be surprised. I applaud you!